When it comes to scoring travel deals, one of the key things is to be flexible. This is the case with award travel as well. Perhaps moreso with premium cabin travel. While most airlines have anytime/full rates – they are painfully costly, as in double the saver rate. The plus is you can fly whatever you please – the downside is… you could fly twice as much on the saver rate. It may simply be worth paying cash instead of points/miles as well. I’ve found myself getting the most use out of United miles. Even though some tricks no longer work, they still provide a lot of options, such as a free segment within the middle of a trip. I’ve used these for my mostly SouthEastern Asia (SEA) traveling recently, although it’s easy to come up with good Euro itinerary drafts as well. Sometimes to get the airline/date/flights you want, you may need to take extra stops or longer layovers. This is more painful domestically, although it’s not uncommon for an international flight to have a stop, depending on how cheap a flight you’re looking for or how remote/exotic the destination you’re heading to is. 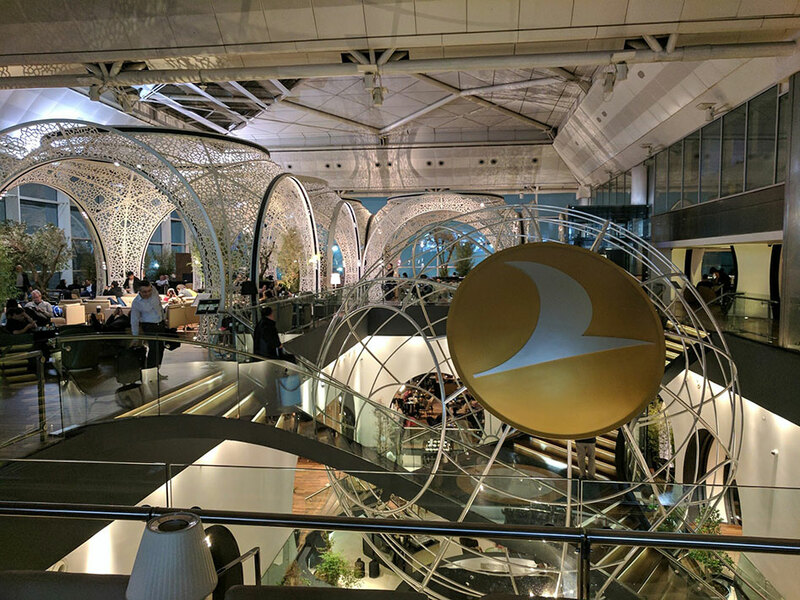 If you’re flying premium class internationally this is not a big deal – you’re very likely to have access to a nice premium class lounge. If you’re flying economy domestically and with two kids… then yeah, things are going to be a lot more painful for you. I really wanted to use American Airlines miles on this trip, to preserve my stash of United miles and to start working on the AA ones, as I have a huge pile of them. They seem better for going north or south, less so for going east or west or with trickier itineraries. Going east with AA you want to avoid fuel surcharges/British Airways/England – you could route through a Middle East partner **except** AA will price a stop through as two separate tickets! Very lame and frustrating. I think you can only transit through the ME for free if heading to Africa. Which means you’ll be going west. American Airlines, Cathay Pacific, Japan Airlines, and Malaysia Airlines are SEA partners for Oneworld. Booking this trip would have been easy with Star Alliance and United miles; in part because their partner Thai Airways could do so much work. My destinations were full visa stays of 30 days in Manila, 60 days in Thailand, and 30 days in Bali. I didn’t think this was actually going to work, but just about when I was about to go for United, got some of the major flights with AA to do so. Although I’ve ended up overall with some pretty painful itinerary points. I wanted to fly premium class and have access to a lounge. The worst layover would still and always be an overnight one though – many close at a certain time, although some very nice lounges are open 24/7 and even have places to sleep. I’ve had 6 years of award travel now and only had truly overnight airport layovers twice, however I’ve picked up a couple just on this trip, unfortunately. Map generated by the Great Circle Mapper - copyright © Karl L. Swartz. The AA bookmarks I got to work to surround my trip were ORD-NRT-MNL on Japan Airlines, and DPS-HKG-ORD on Cathay Pacific. This came at a cost of 70k + 110k AA miles, and $94.96. 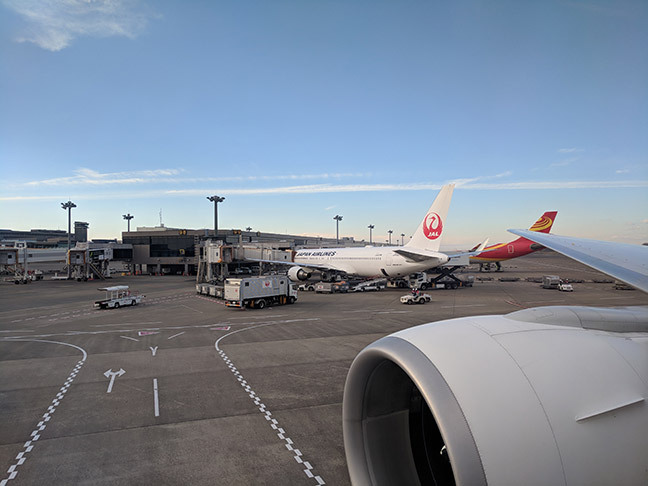 The first leg is business class and has an acceptable layover in Tokyo at the JAL lounge. As I’m AA rich, and Cathay Pacific has the fancy pantsy first class service and suites, I decided to spring for first, which I rarely do. 40k extra is a lot of miles, and although I’m sure it’s better, it’s simply not that much better to me. I am more than happy enough with business class anywhere, but over the past 3 years my AA account has barely budged. I may as well spend some of these now, before AA devalues them. Unfortunately DPS-HKG lands at 9:05pm and HKG-ORD doesn’t leave until 11:55am – at 15 hours, it’s a pretty substantial layover. They also only had economy open on the first leg, a 5 hour flight, on a 3-class bird (business, premium economy, economy) – although it is likely a business seat will open up for me to take. Can I hang out in a very fancy lounge and eat the hell out of it? The answer is most certainly yes – I plan on gaining some weight on these Cathay flights home. However the lounge is open 5:30am to 12:30am (early!) so I will have to leave. I have a buddy from college out there, so perhaps we’ll catch up for some drinks. It will be a Friday night. The Cathay suite alone HKG-ORD is $18,500 – so it’s a steal of a deal flying through from Bali instead! What’s amazing is that the direct HKG-ORD one way in economy is over $2000. This is quite an expensive airline! This of course makes up the longest legs and largest costs of my trip, although inside it I’m also going into Thailand and then back out of it. Since the dates I was doing as the start and end of the trip were the only such flights available, that meant my leave Philippines and arrive Bali dates were hard and inflexible. Unfortunately this didn’t lead to the greatest of flights within the middle of the trip. I’m going to Chiang Mai in northern Thailand – and although there are flights that go the same day, and even have the same dollar cost, the available award space is making me take an overnight in Bangkok rather than flying me onward through to CNX. I don’t know why this is really, as my guess is there are indeed seats available. I also think I will overstay my visa by 1 day if I go through immigration on my day of arrival… so I’m considering loitering around until midnight to actually go through immigration. all routes lead through pain… hey waitaminute! Previously no economy ticket was available so I said I may as well pick business – it’s a shorter flight but hey, it’s barely any points more. Painless economy tickets are now indeed available though! Not really worth changing at this point – I’d save some pain but my visa days are calculated around me arriving the 12th, as well as my airbnb stay. Plus the change fee is $125. I can definitely stay in Bangkok a night for that if I feel like going to a hotel. I suppose the lesson learned here is: wait for closer in to big your smaller shorter jumps. I booked this 2/11 flight on 11/12, as I type this it’s 1/15. United has a $75 close-in booking fee if 21 days or less from travel – making your ideal time to book a flight like this with award miles around 30 days out. Duly noted for the next time! This time I’ll be having a 10 hour Bangkok layover. It’s one of the ones I’ve done in the past. The Thai Airways lounge isn’t nearly as cool as the Cathay one. It closes at 1am. We’ll see how it goes, unsure what my plan will be running through here yet. My outbound trip doesn’t require any overnight, although it does have 2 stops; a 2 hour and a 1 hour layover. I’ll be making it to Koh Lanta from Chiang Mai, and the return is coming from the Krabi (small) airport, KBV. My only available points partner is Thai, and they are routing me through BKK. Then we stop through SIN. I suppose the one plus is I get to try Singapore Airlines, in business class, although it is a shorter flight (2.5 hours). There is a Thai business seat available, although it’s arguably worse, as it is only 1 stop through BKK but requires an overnight layover. Since KBV is a small airport, *every* flight on the way to Bali (DPS) requires a stop. My itinerary on this one actually really isn’t that bad compared to most options in google flights; it’s actually better than most for economy. For business it’s actually way better. Guess I should not be complaining about this one, It’s as good as it gets! I did this flight last year although my all United itinerary had me breaking up the KBV-BKK and BKK-DPS legs anyway, so I didn’t realize this is about as good as it gets until writing this article. So let’s tally up costs and similar flights. Chase will give you a penny per mile, at least, so Chase UR (transferable to United) are worth minimum 1% cash back. I try to get 2-5 cents per mile out of redemption value. If I paid cash for flights, I wouldn’t do these anyway; ie. I’d never fly Cathay Pacific first class at this wild price. I’m cheap so I wouldn’t fly the cheapest business class either – but that’s $3,315 from DPS-ORD on this same date; using that leg for cpm, the AA redemption would still be 2.97 cpm (cents redeemed per mile) – still a solid redemption. I don’t think you’ll ever beat premium class travel obtained via mileage for award flights – it’s simply a fantastic deal. If you did economy for all these flights, I think you’d find the miles game to be a solid redemption and one to play as well. Plus they’d generally be half the cost of these; so you could go twice as often in economy for the same price, or fly another person with you everywhere. Two people in business will drain your stash quickly – but with two people, you’ve got twice the acquiring power of miles anyway. The amount of miles used above really aren’t all that difficult to obtain anyway; a few cards worth of minimal effort. As you can see it’s not always the most ideal flights however, depending on what you’re trying to do. You’ll also have much better luck with simple and more popular itineraries, ie. fly to Paris and back. As is always the case, the more flexible the better the deal you’ll be able to find. ← How tf round trip to Europe for 100$?